If you follow tech news, you might have heard that a big milestone in quantum computing happened this week. A research group in Australia has demonstrated, for the first time ever, a functional CSWAP gate. Here’s a link to their paper. Controlled-swap gates are universal (any logical or arithmetic operation can be constructed entirely with them) and are believed by many to be a fundamental building block for practical, general-purpose quantum computers in the future, so a functional quantum CSWAP gate is a big deal. They were theorized three decades ago by Ed Fredkin, the same guy who, in 1960, invented the trie data structure that inspired InfiniBox (and was best friends with Richard Feynman, believes the universe is a computer, became a full professor at MIT at age 34 despite not having a college degree, is a pilot, and lives on his own private island in the Caribbean). If you are old enough to have gone through new hire tech training with me you’ve heard all this before. There was no practical use for tries when Fredkin invented them 50 years ago. But today, about 6 billion humans carry a small trie in their pockets (mobile phone dictionary) and there are also about 75000 big tries out there storing the future. Same thing with Fredkin’s gates. 30 years later we have no idea how they will impact humanity, but we’re a tiny bit closer with the news this week. Why am I writing this? Don’t ever think your work doesn’t matter or let anyone tell you your ideas are unrealistic or impractical. Usefulness is rarely obvious on day 1 and modern society was built by unrealistic, impractical people no smarter than you. 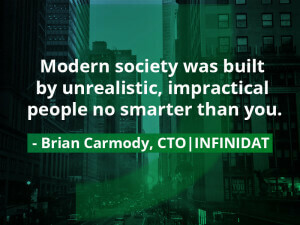 We all work very hard every day at INFINIDAT and sometimes the fruits of our labor are not always seen. But, when you work with people who trust you, who know that what you are doing makes a difference, and understand that time will unveil true genius, I am inspired.